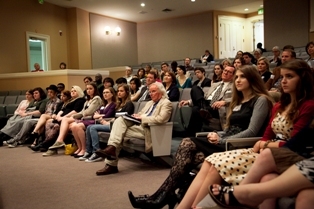 The Alabama Writers’ Forum invites high school teachers to submit their students’ creative writing to the 2012 High School Literary Arts Awards and Scholarship Competition (HSLAA). The postmark date is January 18, 2012. The 2012 HSLAA is open to Alabama high school students in grades 9-12. Cash awards are available to high school seniors through the senior portfolio competition. Categories include poetry, short fiction, drama, creative nonfiction, portfolios, and literary magazines. Published Alabama writers will choose the winning entries. Judges remain anonymous until the awards are announced. Complete guidelines, including mailing address and entry forms, are available on the Forum’s Web site. Please note: Each entry form must be completely filled out, including addresses, zip codes, and teacher’s e-mail address. Incomplete entry forms may cause the entry to be disqualified. The Outreach/Education sub-committee of the Alabama Book Festival planning committee invites the state’s high school students (grades 9–12) and university undergraduates to participate in the first Student Readers Group. This new program of the Alabama Book Festival (ABF) will select one Alabama-related book per year for student participants to read prior to meeting the author and discussing the book at the festival on April 21, 2012, at Montgomery’s Old Alabama Town. This interdisciplinary program seeks to engage high school and college students in Alabama’s culture, literature and history by selecting and encouraging the reading of books (of nonfiction, fiction, or poetry) that connect to or discuss the realities of life in the state. Jim Crow and Me: Stories from My Life as a Civil Rights Lawyer by Solomon Seay Jr. is the inaugural selection for the Student Readers Group. Stuck on what new books to give as gifts this holiday season? First Draft Reviews Online and our New Releases feature can help. Browse the page to see what your favorite Alabama authors are publishing this holiday season. Each week on the Alabama Arts Radio Series, staff members of the Alabama State Council on the Arts visit with writers, musicians, visual artists, and other individuals who contribute to our state’s rich artistic traditions. Recent literary interviews include Jim Hilgartner, Virginia Gilbert, and Jake Adam York. © 2011 The Alabama Writers’ Forum, Inc.